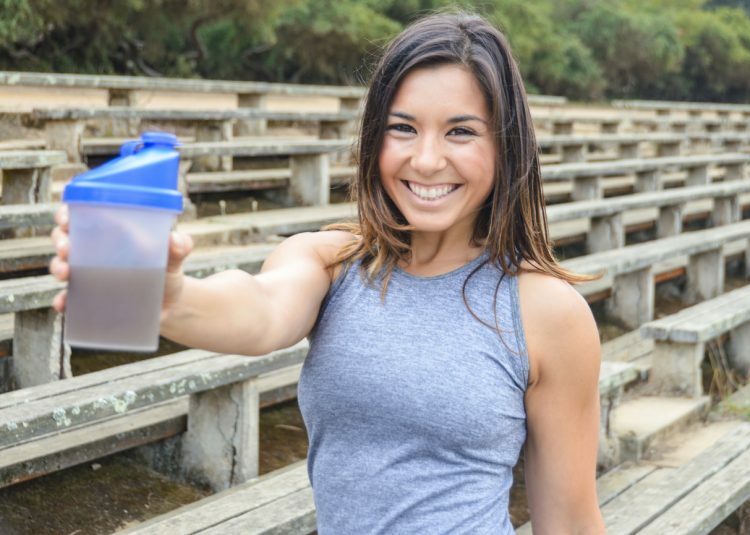 Once the realm of bodybuilders and athletes, protein supplements and powders have now become a regular part of the fitness enthusiast and health seekers diet. Protein powder was the supplement once dominated by core users in bodybuilding and athletics and purchase points limited to specialty stores and gyms. Now the target audience has grown to include fitness enthusiasts and health seekers who purchase their product in almost any mainstream retail store. In 2013, U.S. protein supplement sales exceeded $7 billion, with protein powders accounting for $5.6 billion (77%) of that total – sales are expected to increase by over 40% by 2018 (1). So why the surge in the popularity of protein powder? Explanations lie in the evolving nature of fitness trends which now include more competitive-type events (e.g., Spartan runs), the popularity of shorter, more-vigorous exercise workouts (e.g., HIIT), and changing sociocultural events driving an eat-on-the-go mindset (i.e., high-octane fueling) which is gravitating consumers to these products. Another explanation lies within the growing research connecting protein to health (i.e., heart health, cancer), weight management (i.e., reducing muscle loss) and aging (i.e., offsetting sarcopenia, the age-related loss of muscle mass) that is widening protein’s consumer base (2). Although the government labels protein powders, bars, etc. as supplements, this product is predominantly derived from the process of making Mozzarella cheese; separating the curd (casein) from the whey. Furthermore, the process of producing whey isolates or concentrates is almost identical to the process of producing skim or low-fat milk from whole milk (i.e., micro- and ultra-filtration to remove fats, etc.). Yet, it is interesting that while milk and cheese are considered foods, protein powders are considered supplements. This does pose a potential concern over the scope of practice given the lack of vigorous regulation of supplements under the Dietary Supplement Health and Education Act (DSHEA) governed by the Food and Drug Administration (FDA) (3). Under DSHEA, regulation of ingredients and banned substances is not ironclad. Subsequently, independent third-party agencies exist to voluntarily test and validate protein supplements for quality/purity and ingredients. Informed-Choice (LGC Lab) is one such agency that provides quality assurance by certifying whether supplements and/or raw materials are free of any banned substances currently listed by the World Anti-doping Agency (WADA). National Sanitation Foundation (NSF International) is another supplement testing, inspection, and certification organization who ensures product and ingredient safety. The value of eating whole foods rather than simply protein powders/bars/ready-to-drinks (RTDs) should never be discounted given food’s richer nutrient content and the sociocultural benefits to eating meals, but sometimes they provide greater convenience and impact. Take for example a 185 lb. (84.1 Kg) individual who desires 140g of protein daily (Table 1-1). A balanced approach of ingesting a variety of protein food sources results in 610 more calories a day when compared to the practice of complementing 60g from powders. What this translates to over a one-year period is almost 64 lbs. (29.1 Kg) of energy which cannot be ignored. Table 1-1: Comparing whole food intake versus protein complementation. The term ‘protein quality’ is a popular term used during protein discussion and reflects the amino acid profile of a protein food and how it mirrors the essential amino acid (EAA) quantities needed by the human body (i.e., RDAs). Only the whole egg is considered 100% complete because its profile mirrors exactly what the body needs. All other foods, while not complete, contain at least trace amounts of all EAAs, but not in the ratios matching human EAA RDAs. The amino acid(s) not aligning with the EAA RDAs are defined as limiting amino acids (LAA). For example, cow’s milk is a great source of protein (8-9 grams of quality protein per cup), but holds smaller amounts of methionine in comparison to the RDA needed by the body – milk, therefore, has methionine as its LAA. Because milk protein is the most popular protein supplement source, it makes sense to discuss it in more detail. Milk is approximately 87% water, but remove the water and what remains is approximately 38% lactose, 27% fat, 27% protein and 6% minerals, ash and other materials. Of the milk proteins, approximately 80% is casein, whereas only 20% is whey, explaining in part why whey costs so much more than casein protein. Casein represents a group of insoluble proteins that form a gel (clot) in the stomach when it mixes with stomach acids (much like milk curdles when bacteria feast on milk sugars and release acids) – this slows gastric emptying significantly providing the body with a true ‘slow protein.’ This provides a sustained (slow) release of amino acids into the blood which can last several hours and prolong muscle protein synthesis (MPS) long after the completion of a workout. Casein is a good source of branched chain amino acids (BCAAs) and glutamine, both of which are believed to contribute positively to MPS and muscle recovery. Whey is a soluble protein that empties rapidly from the stomach, therefore becoming rapidly assimilated into the body (whey isolates can enter blood within 15-to-20-minutes after ingestion on an empty stomach). It is mother nature’s ‘fastest protein’ (isolates/hydrolysates) that supports MPS in the immediate hours following a workout. Whey protein is a richer source of BCAAs and glutamine, containing approximately 24-25% more leucine than casein. Leucine is considered the all-important EAA which acts as the engine to drive MPS. The separation of casein from whey produces a whey base, often used as a food filler (e.g., whey powder). Further removal of the other ingredients yields a concentrate and then ultimately an isolate which is more expensive but contains a greater concentration of protein. A whey isolate hydrolysate is a protein chain to which digestive enzymes have been introduced to ‘pre-digest’ the protein before ingestion with a goal of enhancing absorption (i.e., relying less on a normal enzymatic breakdown of protein chains in the stomach by the enzyme pepsin). But, because whey is already the fastest digesting protein, no real difference exists by which slightly faster absorption results in any additional MPS effects in healthy individuals. When making a protein choice, it is important to not base or limit your choices to what you read on a food label. Although a detailed food label providing amino acid profiles provides valuable insight into protein quality, how well the amino acids are absorbed into the body is equally, if not, more important. If the body cannot digest, absorb, and subsequently utilize the amino acids, then the protein is essentially ineffective. The latest evaluation system approved by the United Nations Food and Agriculture Organization (FAO) for quantifying protein quality and absorbability is called the Digestible Indispensable Amino Acid Score (DIAAS) which has now replaced the protein digestibility corrected amino acid score (PDCAAS) method that was introduced in 1989 to assess protein quality and absorbability (4,5). This new system more accurately evaluates the amino acid profile and the food’s absorbability into the body. There is tremendous value in knowing a food’s DIAAS because it helps distinguish between quantity (i.e., how much protein is consumed) from quality (i.e., how much is absorbed into the body). This scoring is also very useful when debating the virtues of animal- versus plant-based proteins. For example, the protein found in peas contains an impressive amino acid profile (in fact the amount of leucine in pea protein is higher than in milk-based proteins), but it is absorbed less efficiently than milk protein (Table 1-2) (5,6). As a basic guide, animal-based proteins generally hold a superior EAA profiles and demonstrate greater absorbability when compared to plant-based protein. Table 1-2: DIAAS for commonly consumed protein sources. An additional factor to consider when comparing animal-based proteins against vegetable-based proteins is caloric density (Table 1-3) For example when comparing one large egg against a ½ cup of raw quinoa, they both contain a comparable amount of EAAs (3.5 grams) although the whole egg is a complete protein with no LAA. The issue with quinoa is that, as a food, its caloric density is significantly higher than that of the egg – approximately 240 kcal more per serving which, when consumed every day will amount to 25 pounds (11.4 Kg) of weight per year. By contrast, when comparing the quantity and quality of protein between a comparable caloric serving of whey isolate and hemp protein, there is an obvious protein difference. Table 1-3: Comparing protein foods on nutrient- and caloric-density. Given this information on protein complementation and protein quality, what needs to be considered next is protein timing and recommended quantities that optimize muscle protein synthesis within the body. These will be discussed in greater detail in a subsequent article.